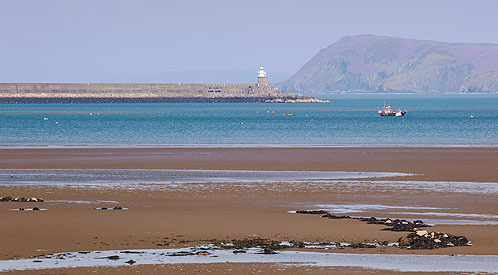 A Medieval Fish Trap , to the North West of Fishguard Harbour , the stones of the structure are visible on a low tide . The North Harbour Wall and Dinas Head in the Distance. The long arms of the structure were built from large boulders . Part of the trap was destroyed when the Rail Line was built in the 1900's , and is the only one of 3 such structures to have it's position recorded on the Ordnance Survey Map (OL35 Explorer Map) . Fish were trapped when the Tide went out and could then be caught in nets. Fish traps In Ceridigion (Aberarth , llanon), Carmarthen Bay and Swansea Bay used a combination of stone structures and willow fences to catch fish. The CADW website lists 3 Fish Traps in Pembrokeshire . The CADW Aerial Photos give a better idea of these structures.